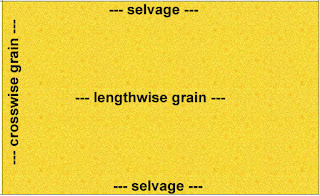 One of the first "technical" terms I learned when I started sewing was "selvage". Selvage is the woven edge of fabric. When you buy a length of fabric, the sales person will measure out the length you want along the selvage, and then will cut it from the bolt by cutting crosswise from one side to the other - cutting from selvage to selvage. Below I've marked where the selvage is - and also show the direction of what we call the "crosswise grain" (aka: weft threads) and the "lengthwise grain" (aka: warp threads) of the fabric. Crosswise, of course, is where our salesperson cut the fabric. I've been sewing for over 50 years. I've made dresses, shirts, pants, coats - all kinds of things. 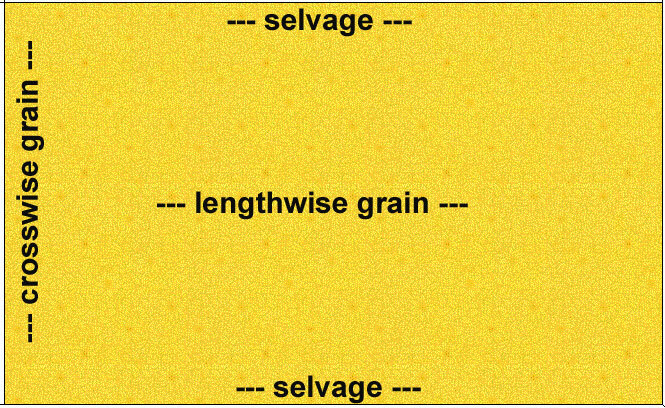 I was always aware of the selvage, and paid attention to the crosswise/lengthwise grain on fabrics with one-way designs and/or nap (velvet, cordoroy, etc.). 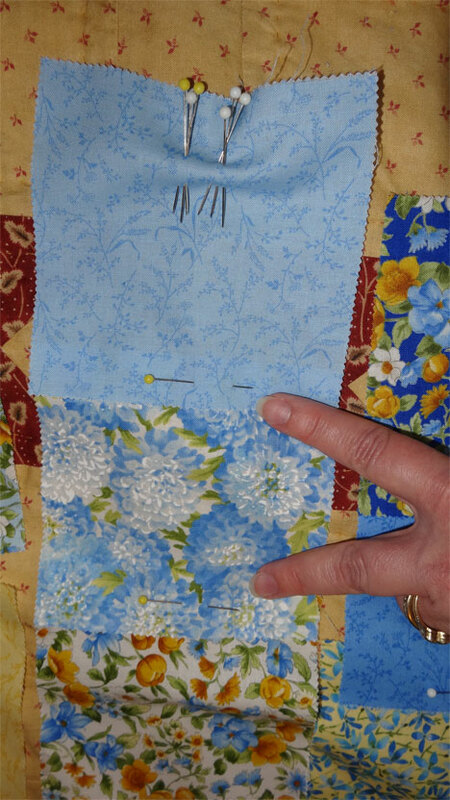 But it wasn't until I started quilting that I became very aware of a big difference between the crosswise and lengthwise grain on woven fabrics. The difference is this: there's usually a bit of "stretch" in woven fabrics - and there seems to be more stretch along the crosswise grain. Sometimes a lot more stretch. That stretch can get you into trouble. If you aren't mindful of how much you are pulling on the weft (crosswise grain), you can get your blocks pulled out of proportion as you go along. It's easy to tell the weft from the warp; all you have to do is grab the sides and pull. The weft (crosswise grain) will stretch more. Of course the traditional remedy is to pin sides together before sewing. But I'm an impatient sewer - and I hate pinning - won't do it if I can get away with it. These days, when cutting out borders, I make a point of trying to cut borders that run along the lengthwise grain - to minimize the stretch problem. When I have to cut along the crosswise grain, I know I have to slow down a bit and maybe even (grrrr) pin a couple of times. 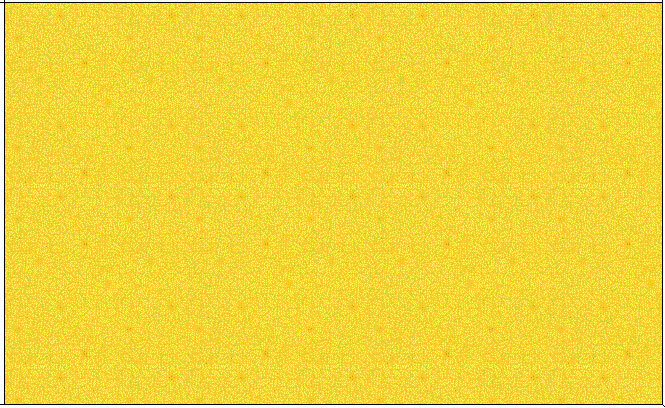 When working with simple quilt designs, such as my recent "Summer Breeze" quilt (below) I check for the crosswise/lengthwise grain when I lay the blocks out. 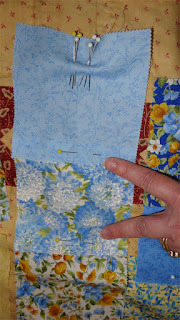 Then I stitch the squares together, joining lengthwise edges to lengthwise edges. After that, when I join the columns together, I am sewing down on the crosswise (more stretchy) grain, and it's easy to get the corners lined up without pinning (I just stretch one side or the other to get the corners perfectly aligned). 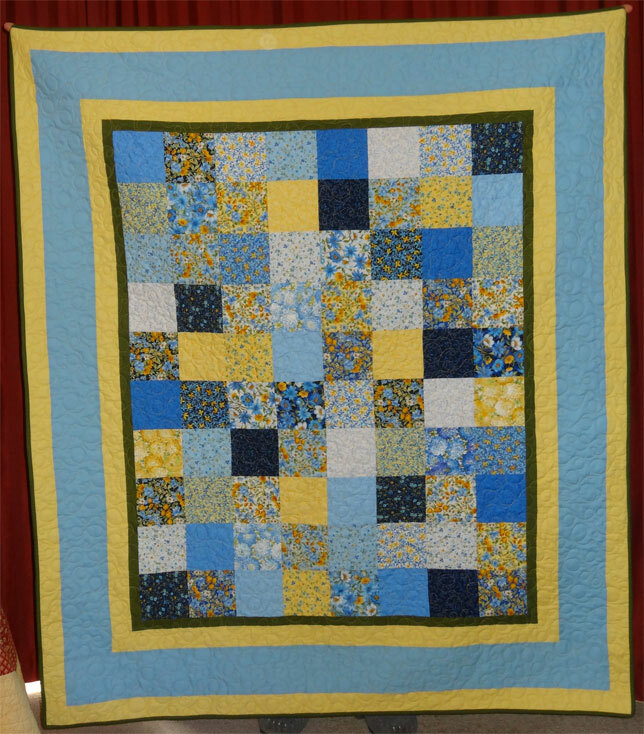 Once I became aware of the weft/warp stretch, my quilting life certainly became easier! 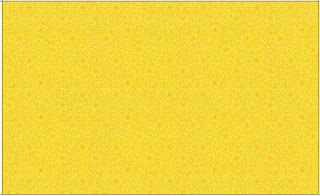 Writing this post was especially fun. As a self-taught seamstress/quilter, I knew what I wanted to share with you, but didn't know the technical terms (other than "selvage"). I did a little research on Google to get the terms weft, warp, crosswise grain and lengthwise grain. I'm not sure well I'll remember those new terms, but I sure don't forget the concept. 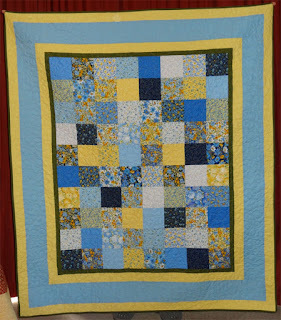 Quilt 25: Jelly Roll Blues - DONE! Quilt 87: The Kaufman "Trieste" in Blue - DONE! Quilt 88: Yet another "Triest" (in teal) - DONE!